Hey all, Joe here! I'm FINALLY getting to something I have had sitting in a box for a while now. I was waiting for the chance to get a few more items with which to make comparisons, and I finally have. 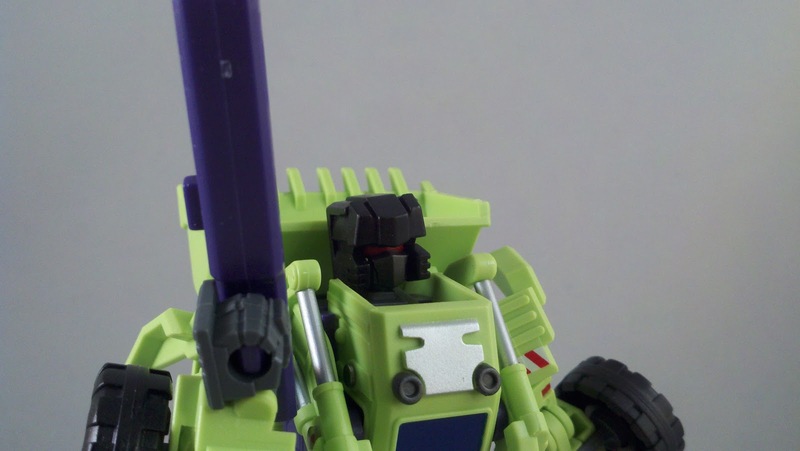 So today, I bring you Part 1 of 7 in OnePerCase's look at the 3rd Party Transformer, Green Giant, by MakeToys! 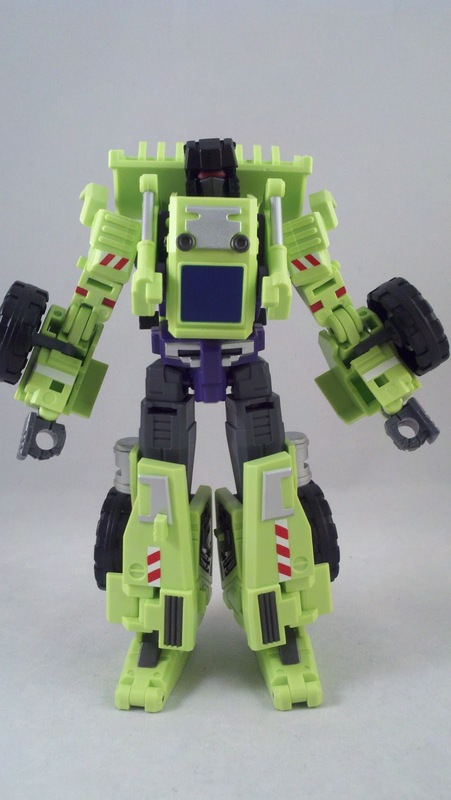 The Green Giant is MakeToys homage to the first Generation 1 combiner, Devastator. Was he worth the wait? Was he equal to TFC's Hercules? 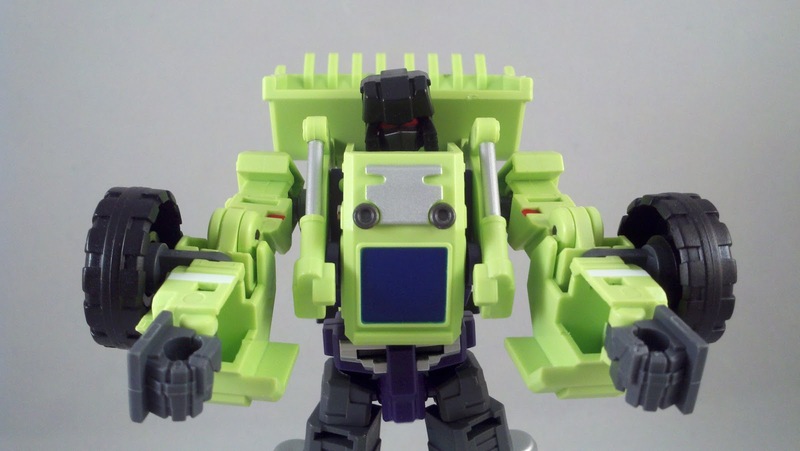 Take a look after the jump to find out how our first figure, NOT Scrapper measures up! Part 1 of our reviews is going to look at MakeToys version of Scrapper. 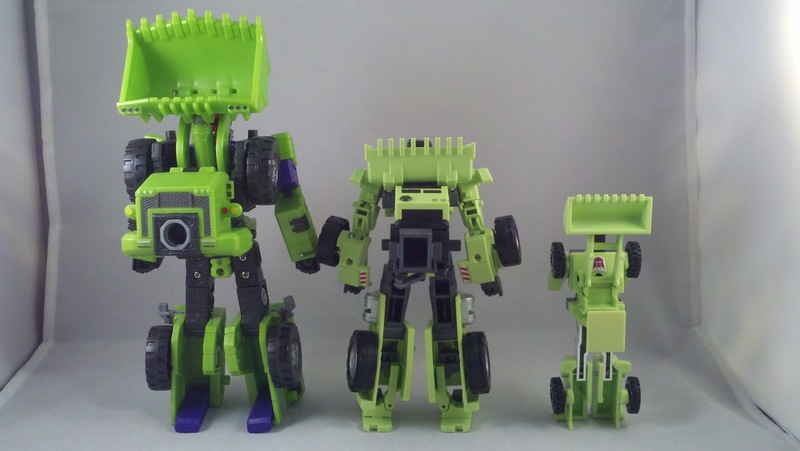 Now, as far as I can tell, unlike TFC and their version of Scrapper, named Structor, MakeToys did not name the individual bots that make up the Green Giant. Based on that, we're going to stick with calling these bots by 'GG' and the Generation 1 names of which they are homages to. 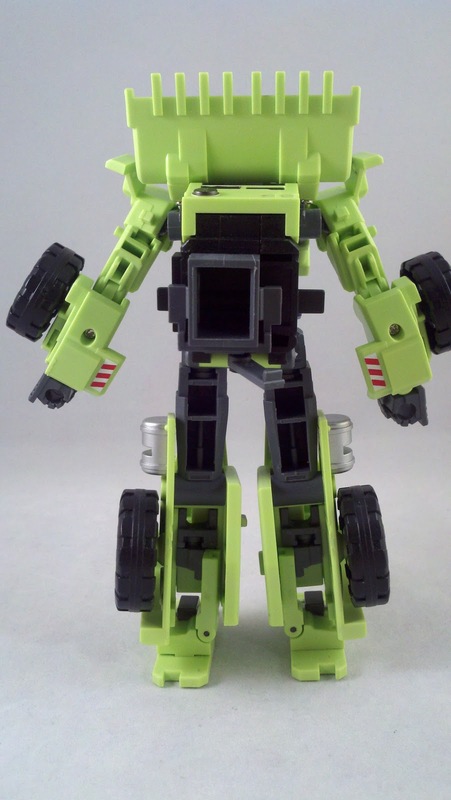 GG Scrapper, like the rest of the Green Giant parts, comes packed into the Box Set in his limb mode. 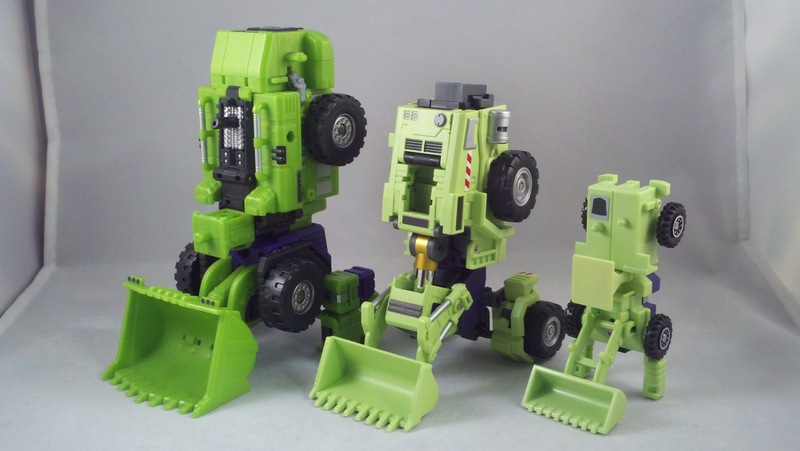 I'll be getting pics of the box and it's packaging in the final review of the Green Giant himself. It is some pretty, pretty packaging. 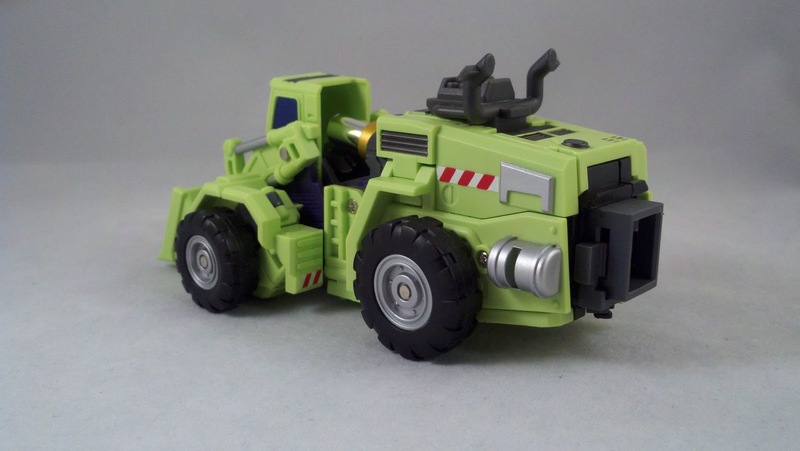 To start, I've gotten GG Scrapper into Alt-mode. 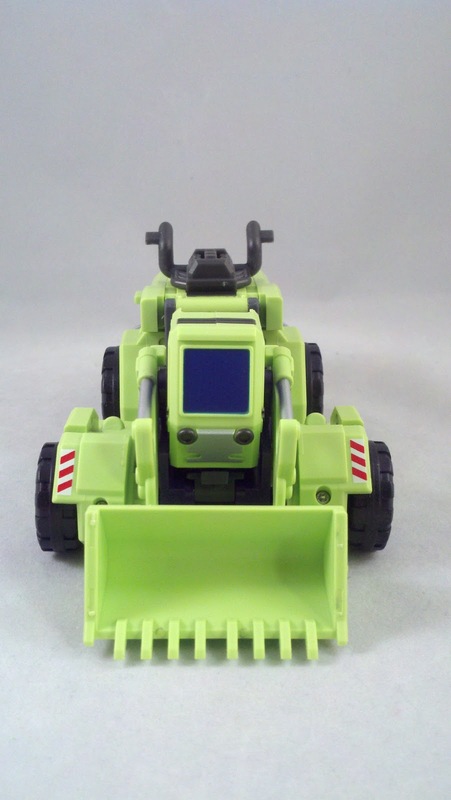 Molded in primarily bright green, GG Scrapper looks like a modified front-end loader. 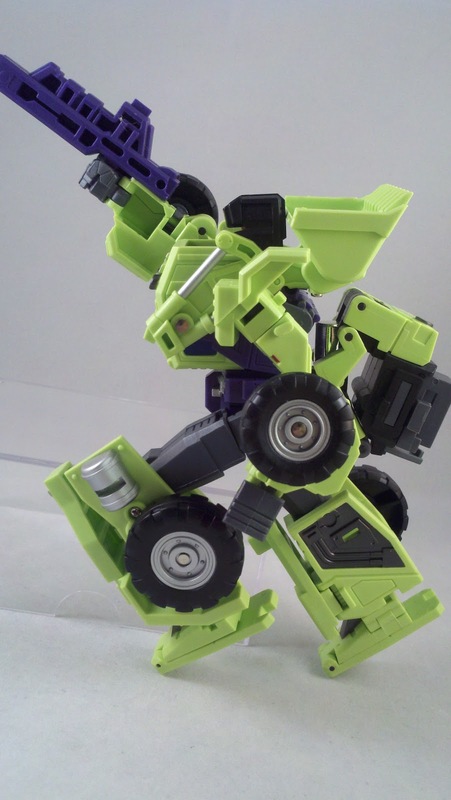 He also contains parts molded in a charcoal gray and some silver/gray. 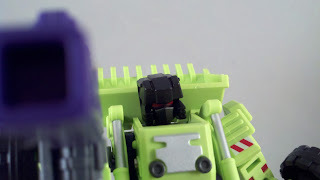 There are a lot of little details packed into this guy. 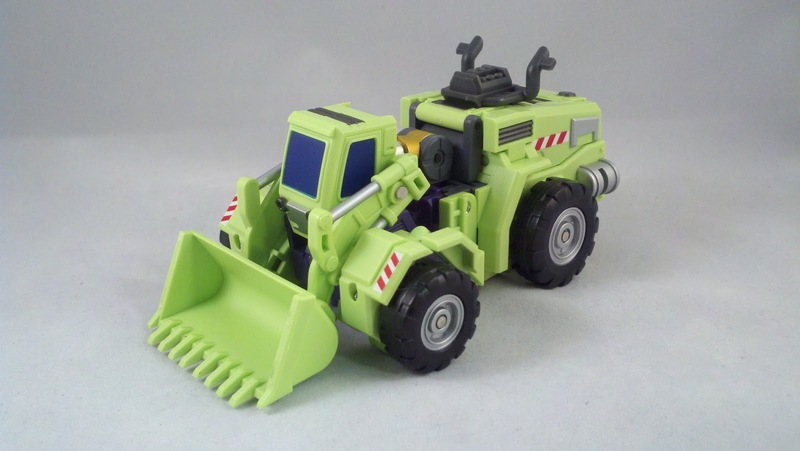 Unlike the figures that make up Hercules, there are plenty of VERY neatly applied paint apps that really lend well to the construction motif; namely all the red and white or black and yellow warning stripes. 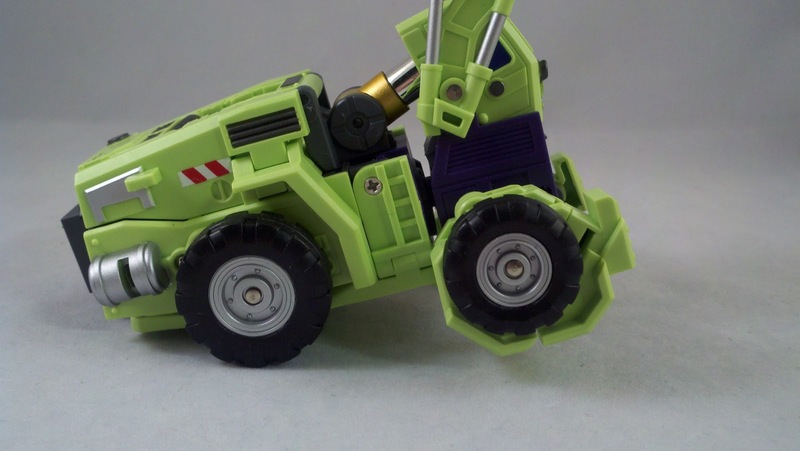 One part that really stood out on GG Scrapper is the piston at the back of the driver's cabin. The cabin itself is hollow with a large open back that the piston just kind of folds into. 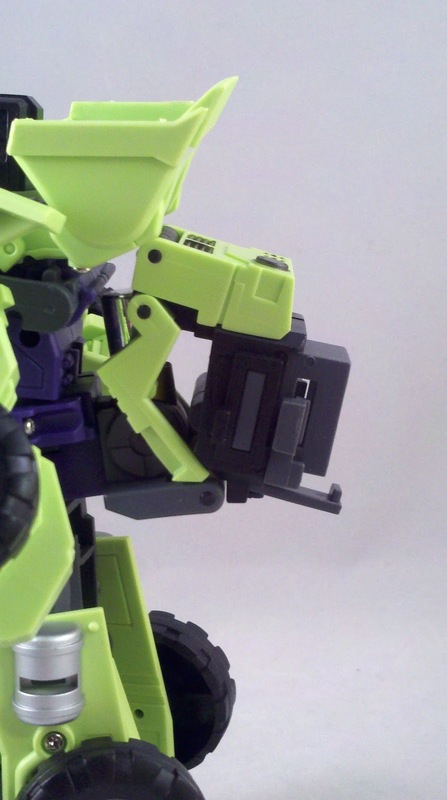 The piston itself is either a very light metal or vacu-chromed plastic. It's an interesting detail that certainly stands out. 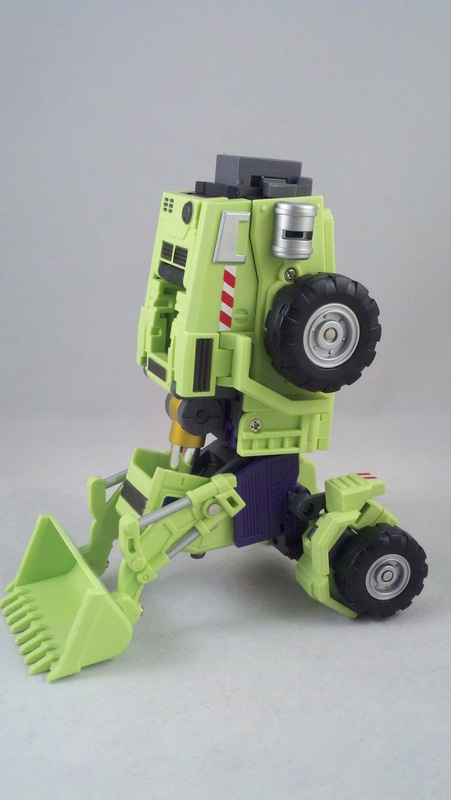 When it comes to transformation, Gen 1 Scrapper is BASIC, unfold legs, pull up head. 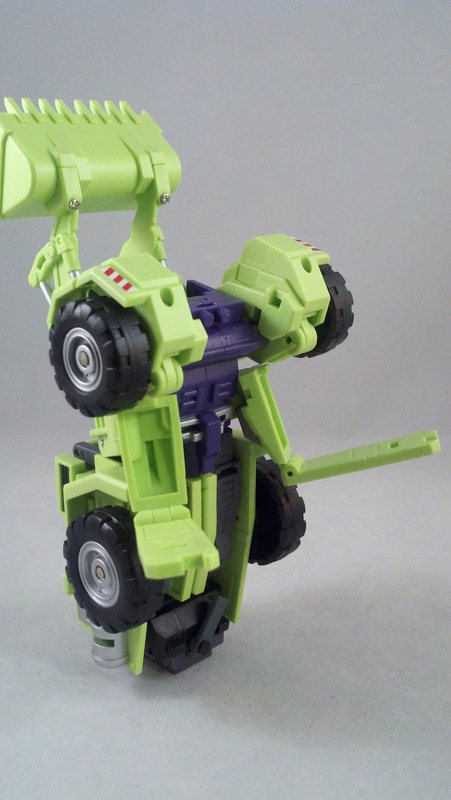 The TFC version isn't too much more than that, fold out the legs, rotate the shoulder plates, and unfold the arms, pull up head. 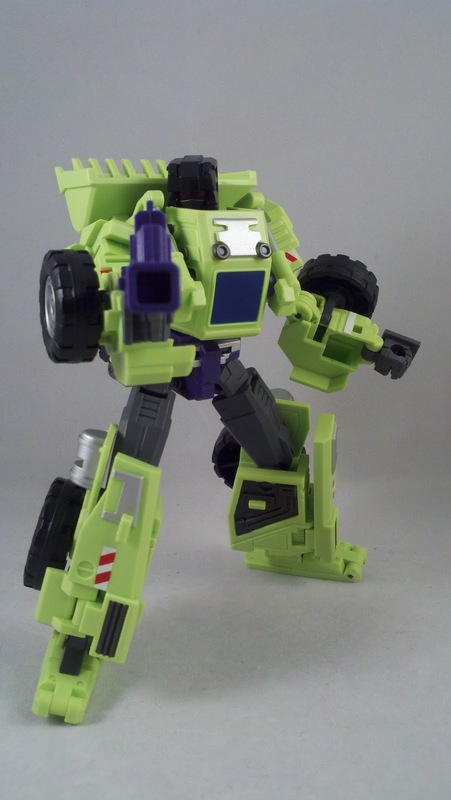 GG Scrapper's transformation is a little more involved than either his TFC cousin or his Gen 1 counterpart. 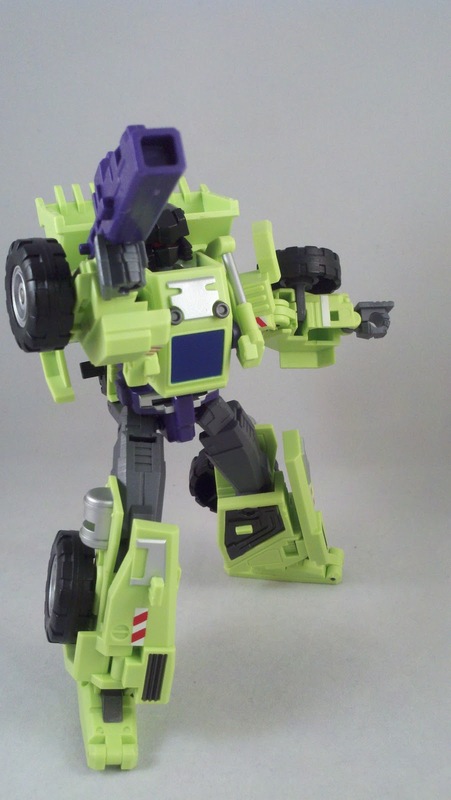 I felt it would be easiest to start in Alt-mode. Start by removing the engine and setting it aside. 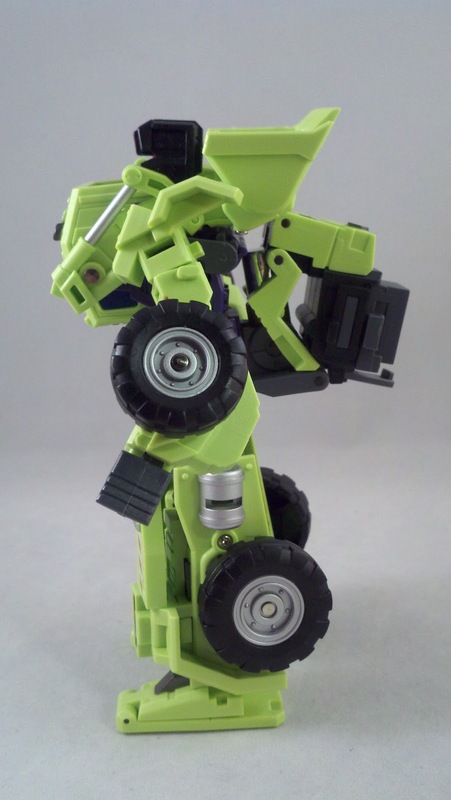 For Bot-mode, the engine does not come to any use. Stand GG Scrapper up on end. 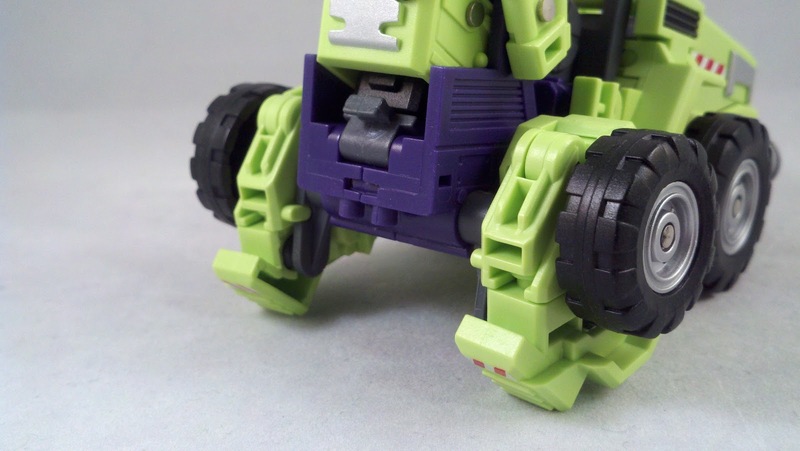 There is an axle that connects both of the front wheels through the body, rotate it forward so the grey pieces are horizontal. 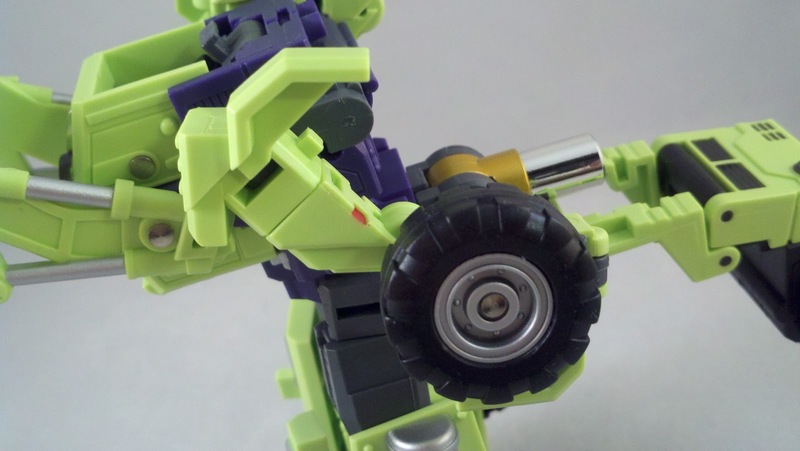 Lift up the flaps that run along the bottom of the Alt-mode body and swing them outward. 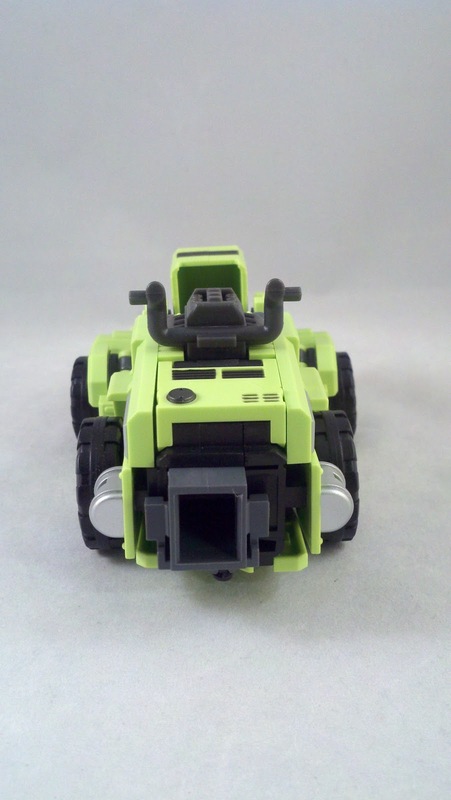 Pull up the the top section that runs the length of the Alt-mode up as well. 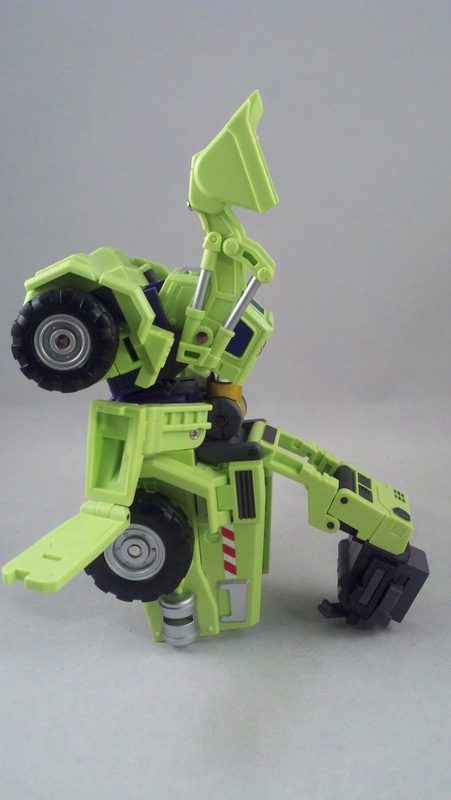 At this point, you can unfold the legs. 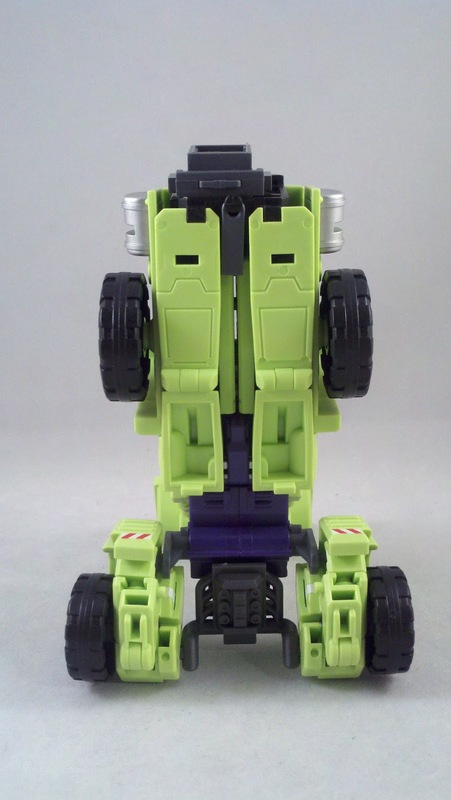 the side panels of the Alt-mode fold inward to form the front of the lower legs. 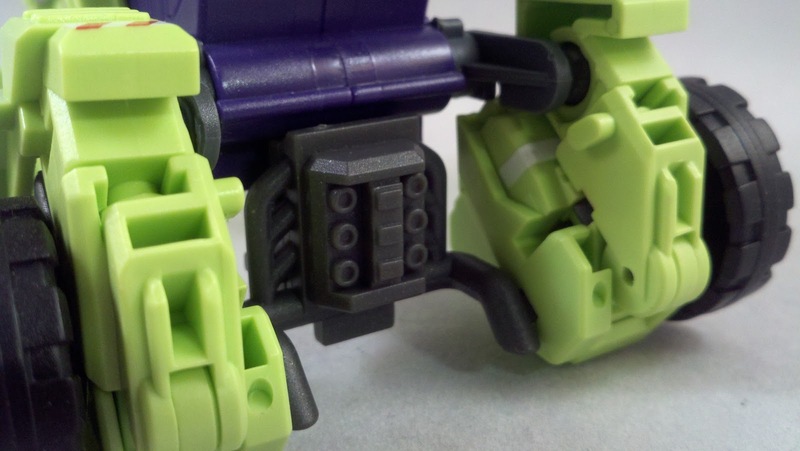 The under panels of the Alt-mode fold back in on themselves to make GG Scrapper's feet. 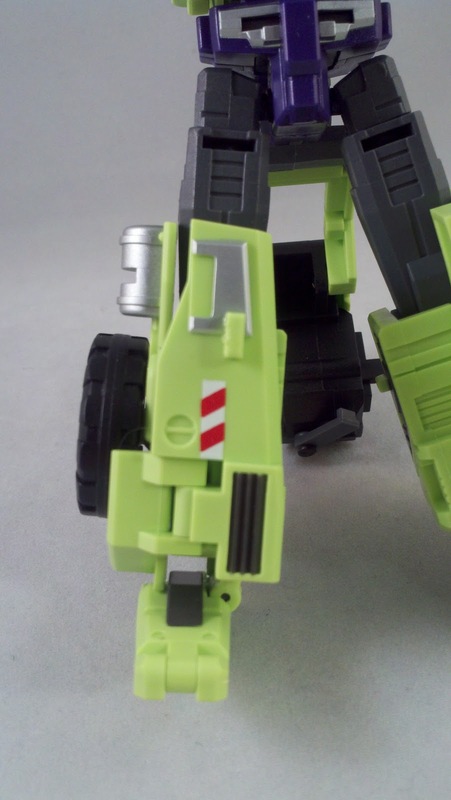 Those in turn swivel 'forward' to line up with the legs and then slide up into the shin. The next step, now that some of the leg parts are out the way... is the arms. 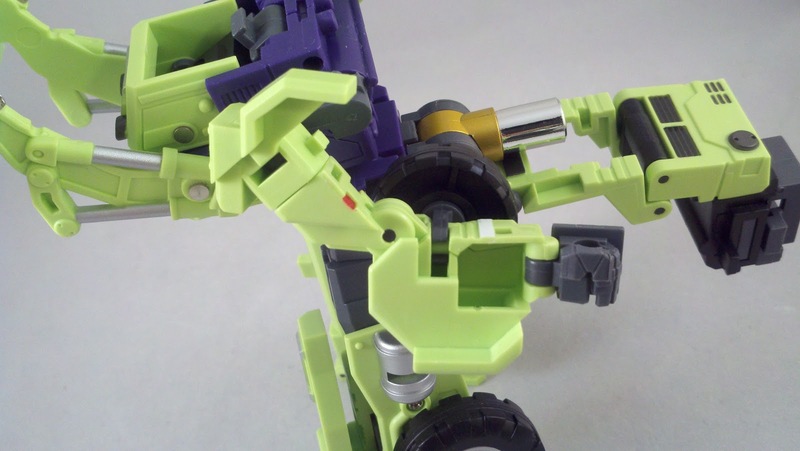 The main part of the arms was the axle running through the body that we've already rotated. 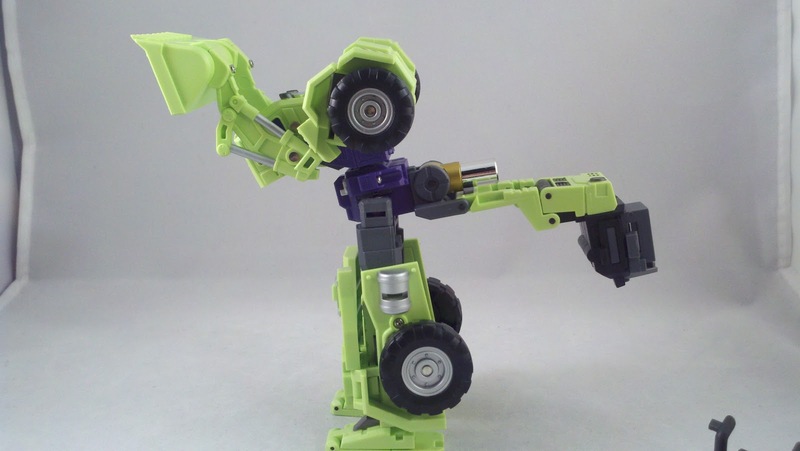 The next step is to unfold the arms. Once unfolded, the wheel is spun from one side to the other and the hand flipped out. Rotate the arms down. 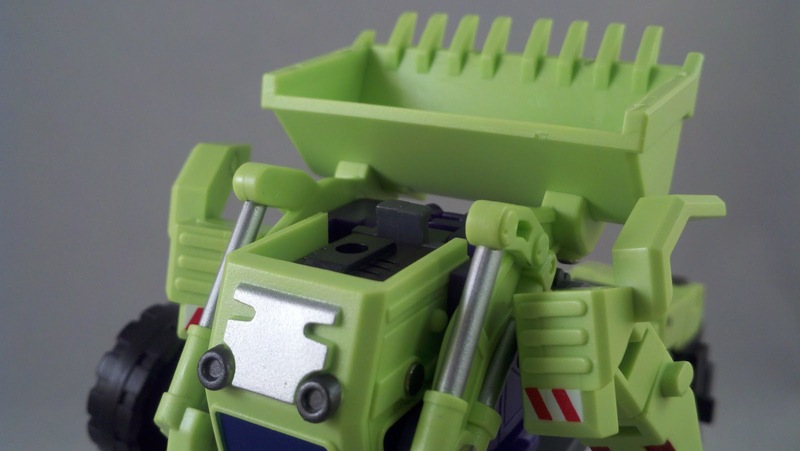 Notice that there is a huge piece of the Alt-mode kibble on his back. For now, I just straightened it out, we'll get to it in a second. 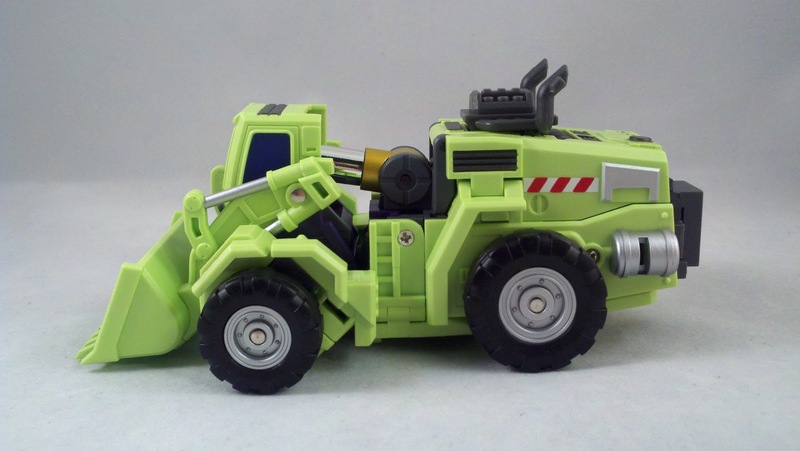 GG Scrappers head is folded down behind the Alt-mode's cab. 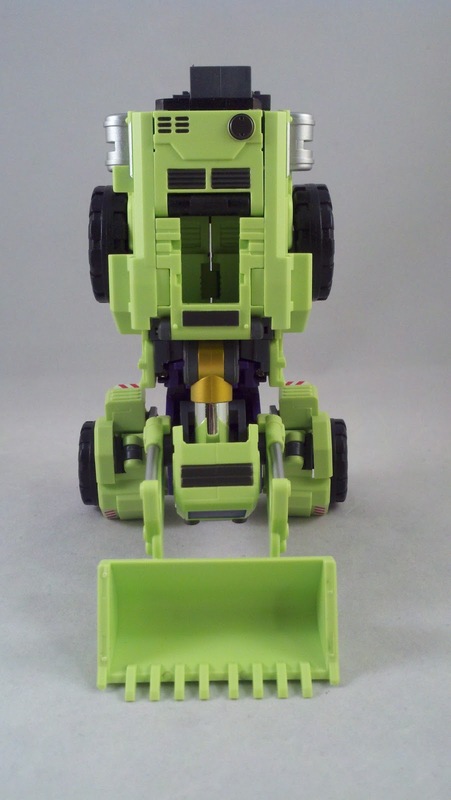 First though, you need to rotate the loader's bucket back towards the body. 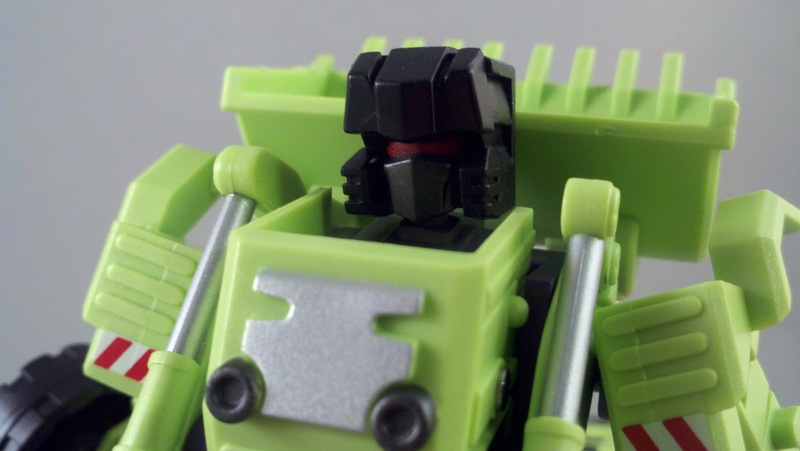 The head flips up in front of the bucket. 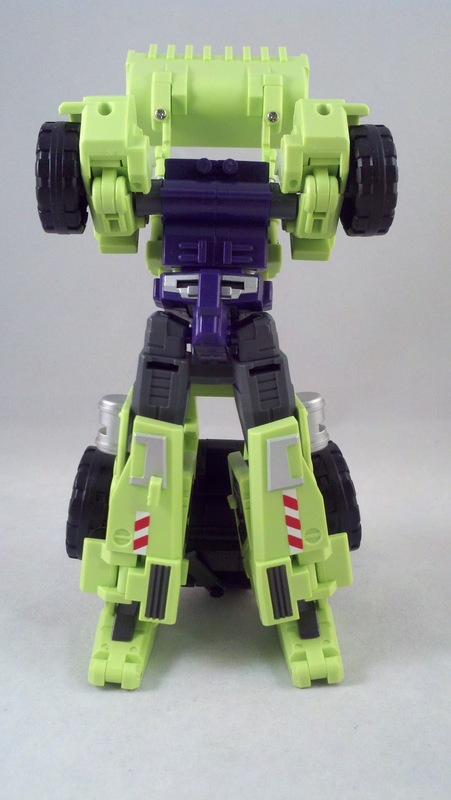 I don't know if it's just mine... but the head does not sit exactly straight. It's tilted ever so slightly to one side. 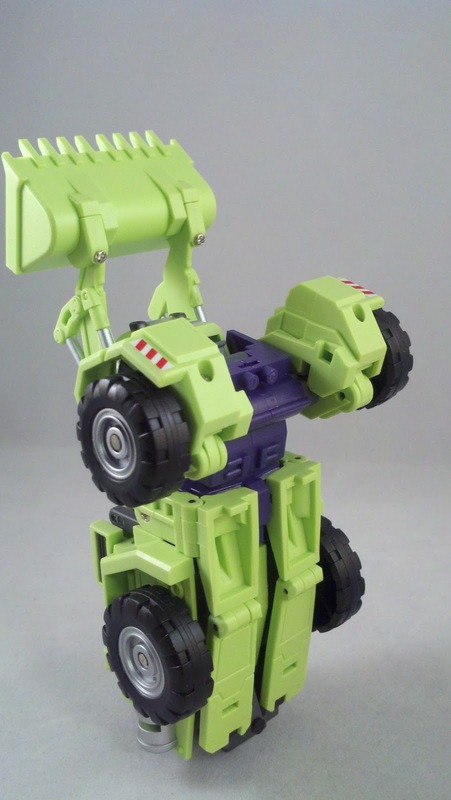 The kibble from the Alt-mode on GG Scrapper's back is merely folded up into itself as tightly as possible. 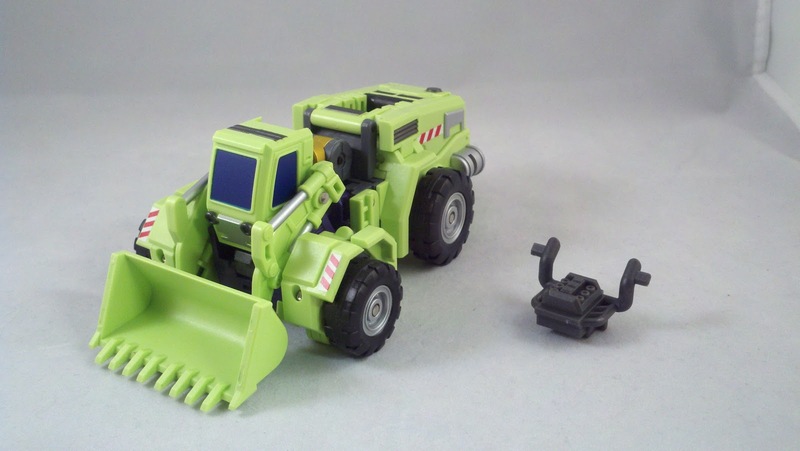 Like his TFC cousin, GG Scrapper's weapon is pulled from the combined weapon of Green Giant. 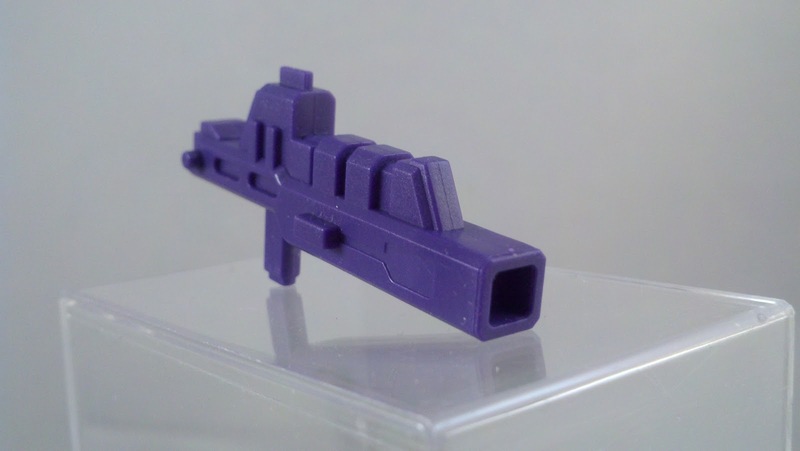 His weapon comes from the upper rear portion and is a purple, squared barreled laser rifle with no moving parts. 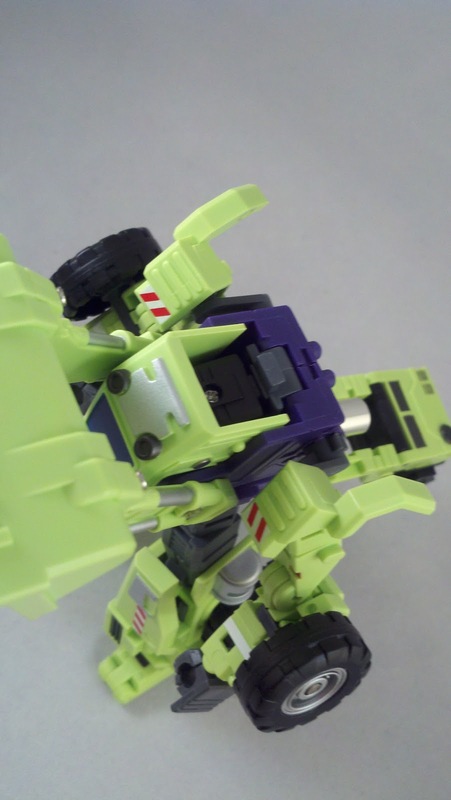 GG Scrapper's articulation is pretty good; he's filled with swivel and ball joints. 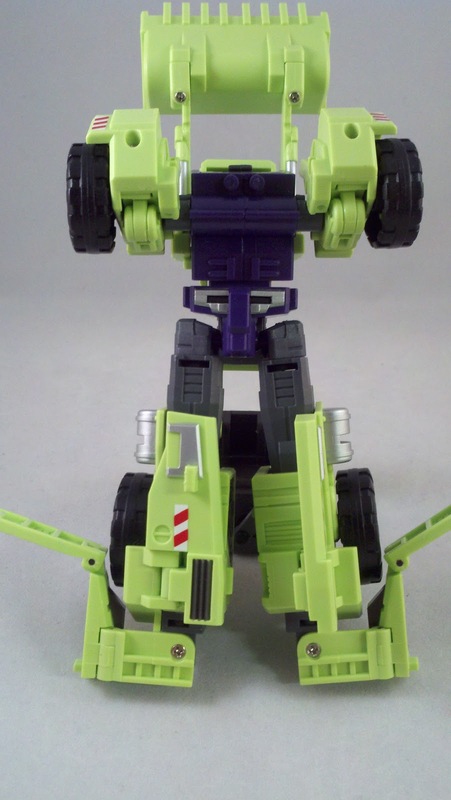 I did find 2 things wrong with the articulation. 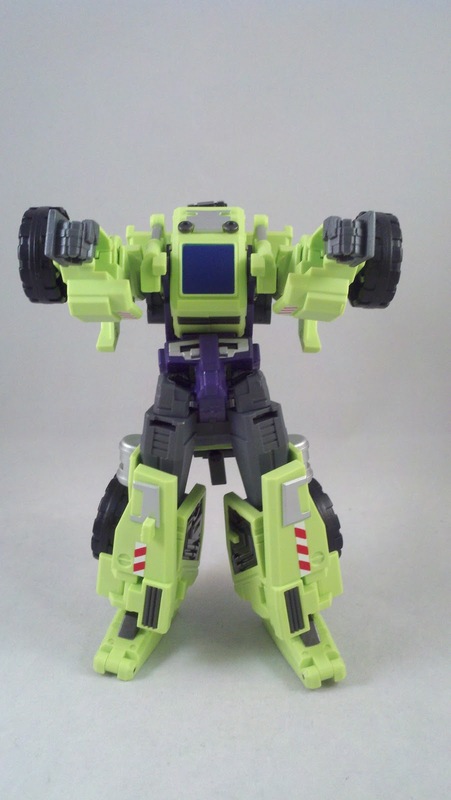 Due to the construction of the shoulders and how the arms are shaped, GG Scrapper can't raise his arms laterally. 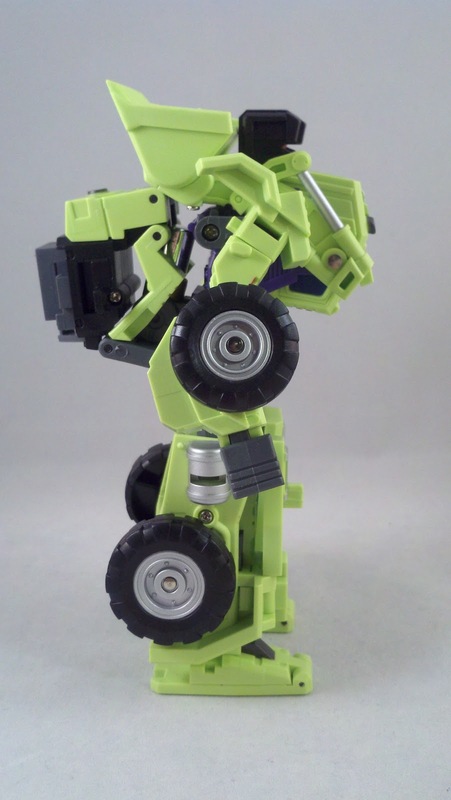 The ball joint allows for an overall front to back movement, but ability to raise them to the sides or outward is practically non-existent. That's as far up as they go. That's as far out as they go. 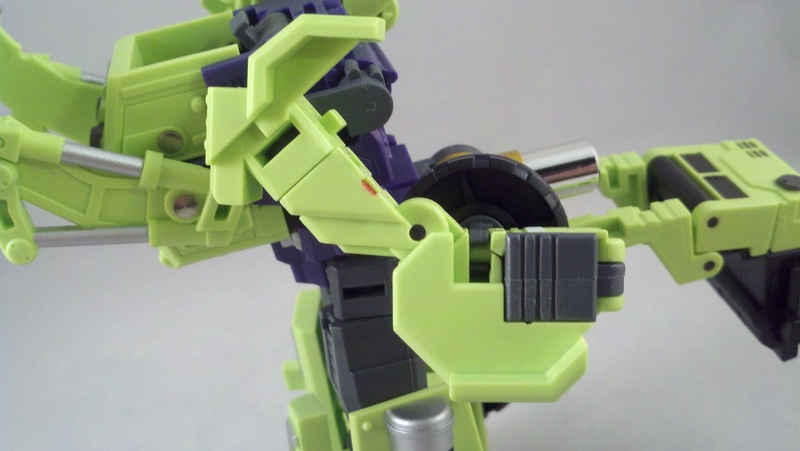 The other issue I came across should be an easy enough fix using the old super glue trick. 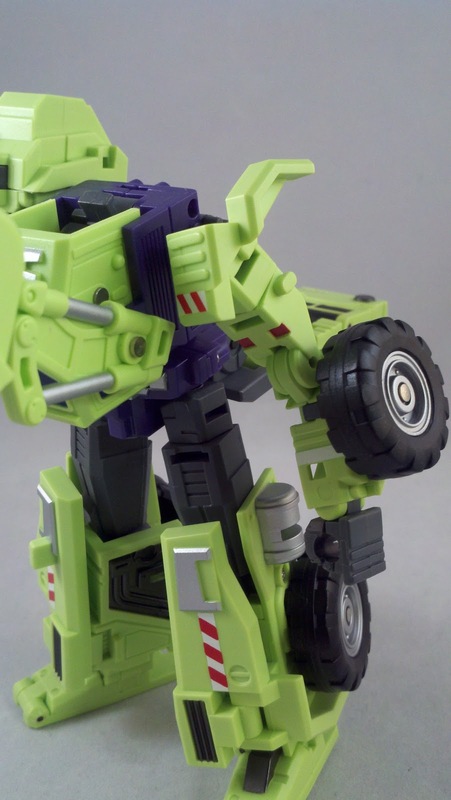 The ball joints at GG Scrapper's hips are loose. 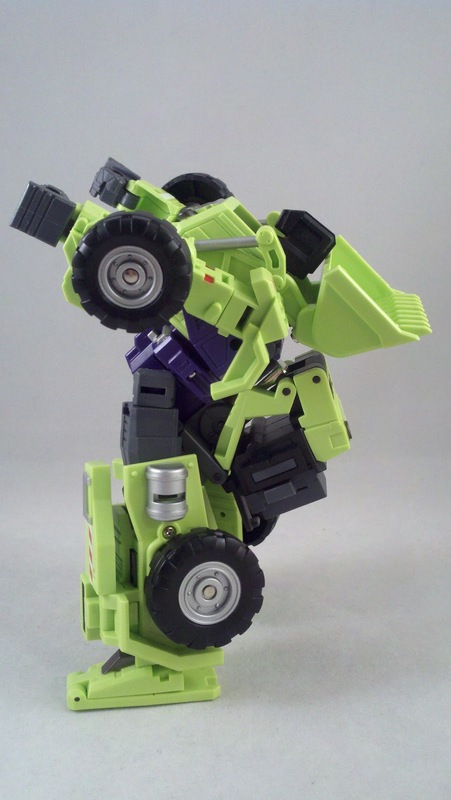 That coupled with the weight on his back, he likes to fall backwards at the hips. 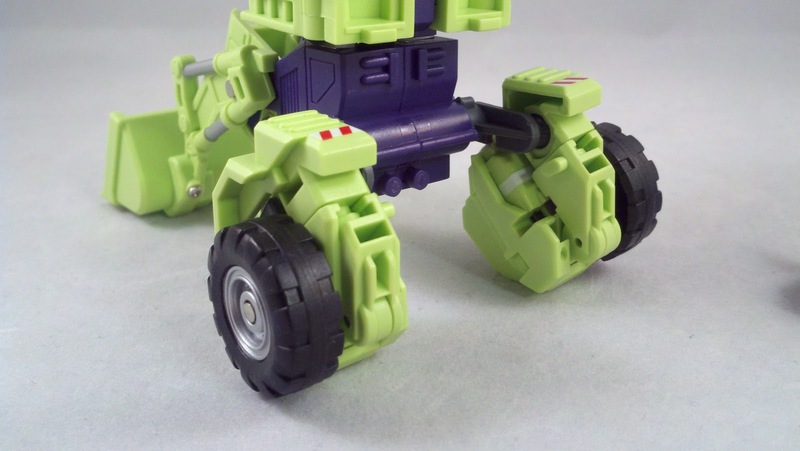 Getting GG Scrapper to limb mode is pretty straight forward starting from Alt-mode. Once again, start by removing the engine. This time, the engine will play a part in the finished mode. 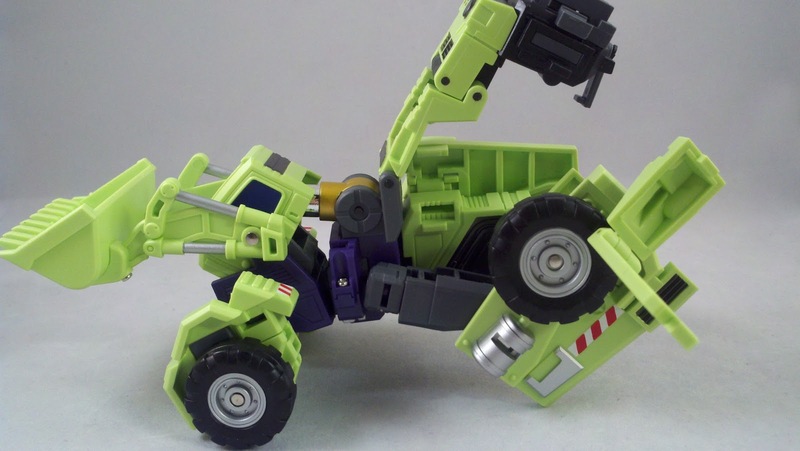 The basis of this mode is the bucket and the arms. 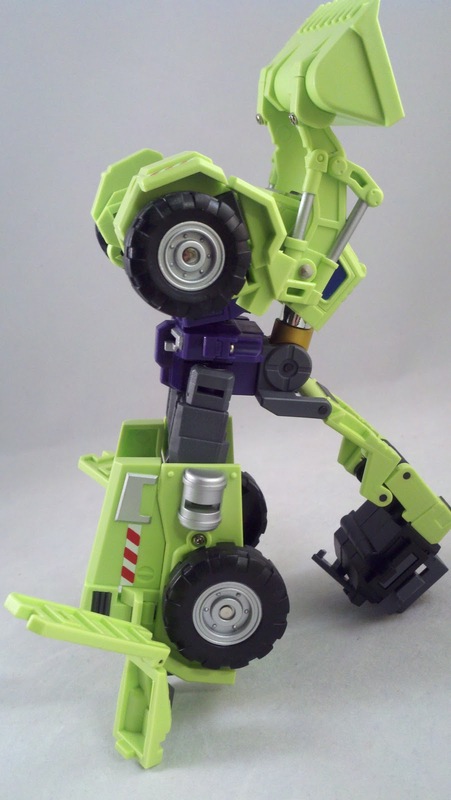 the arms need to be rotated on their axle once again and then further along. 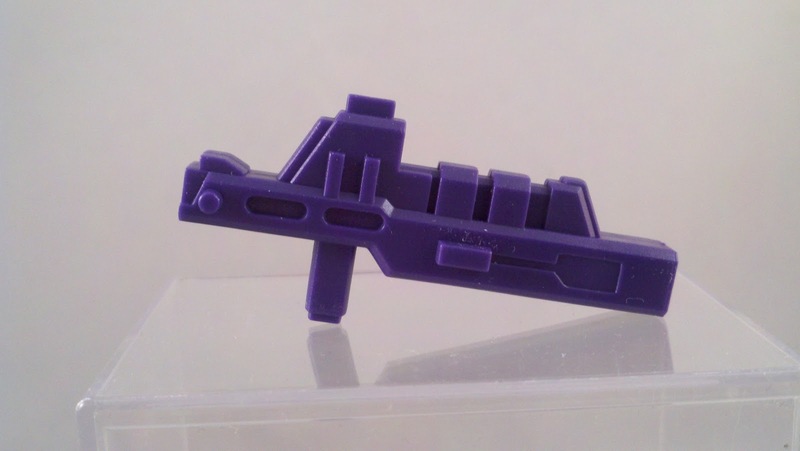 The engine will fit onto the two small posts on the purple section where GG Scrapper's head hides and then the exhaust pipes from the engine snap into place inside the wheel wells/arms. 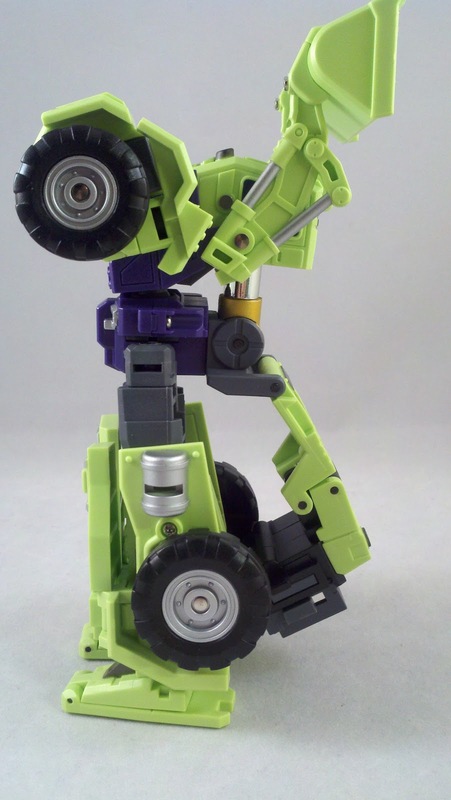 Stand the leg up on end, and voila, Limb-mode. 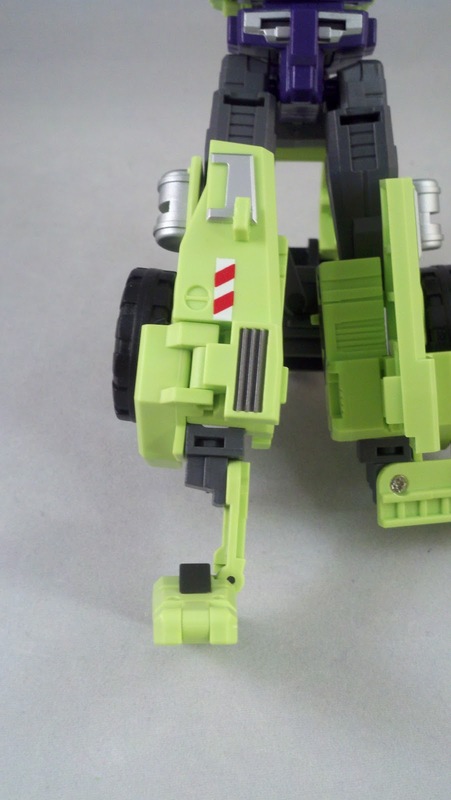 The leg has some articulation that will lend to Green Giant's overall poseability. 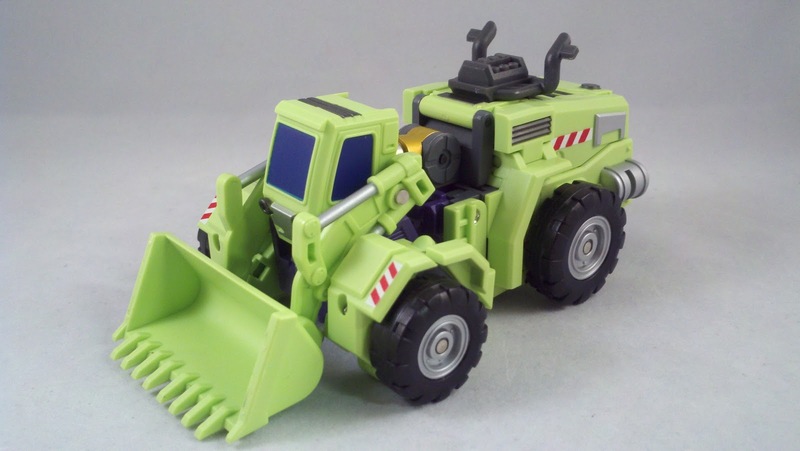 The 'knuckle' in the front end loader makes for an ankle point. The knee is actually part of GG Long Haul's lower torso and upper leg mode which I will be looking at later. As for size... 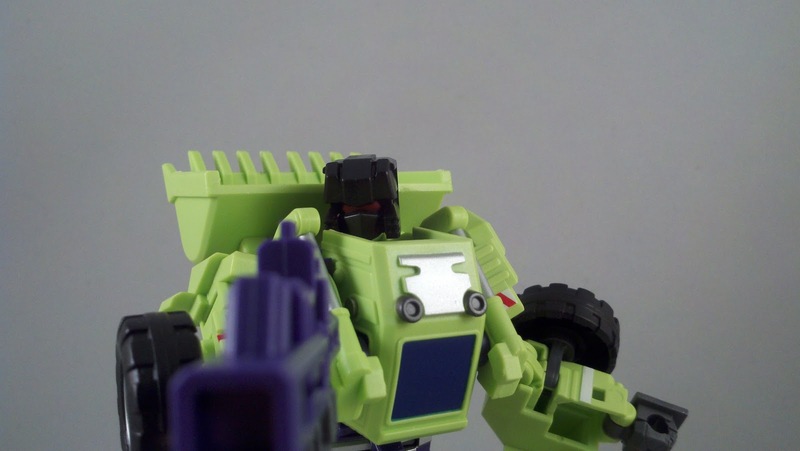 I was able to borrow my friend Kevin's Hercules to once again pick apart and use for this review. 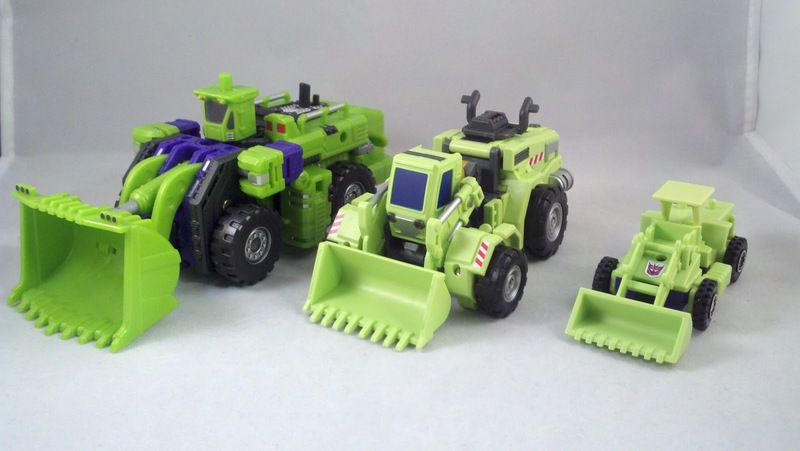 We will look at the overall size comparison when we get to our final review of Green Giant's combined mode. 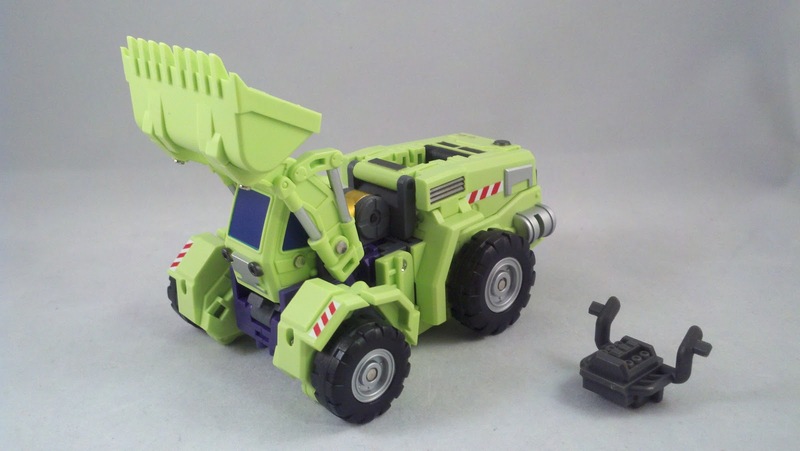 But, for your viewing pleasure, I've got not only Hercules, but the G1 Commemorative Devastator to show off as well. 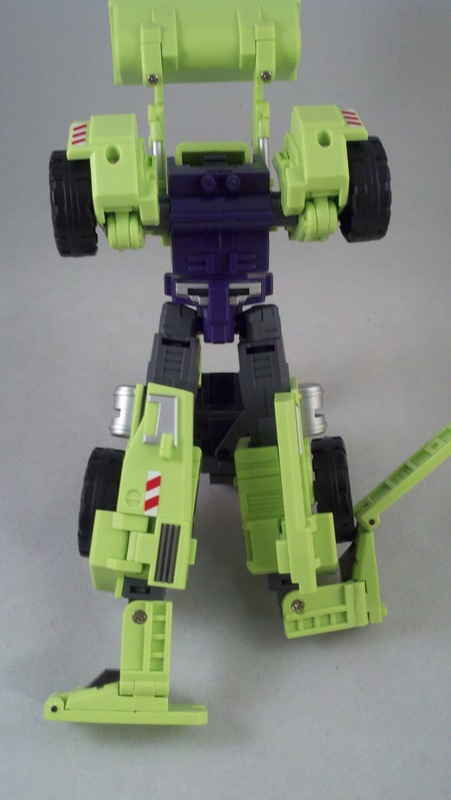 TFC Structor is obviously taller; measuring to the shoulder, by about an inch. 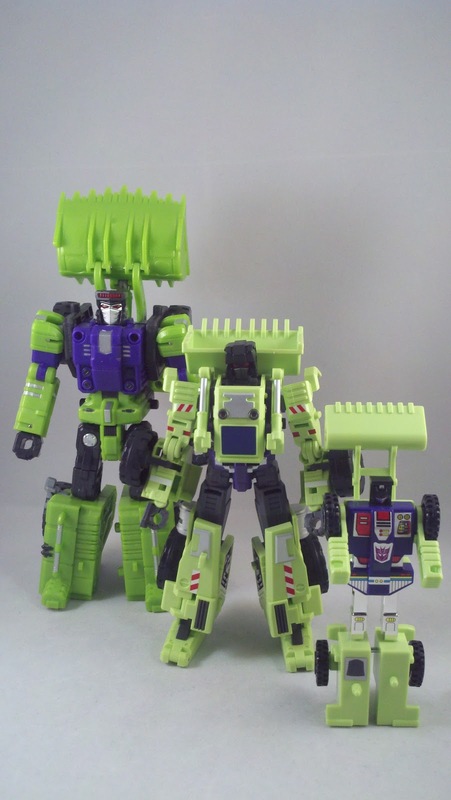 And of course, both tower over G1 Scrapper. 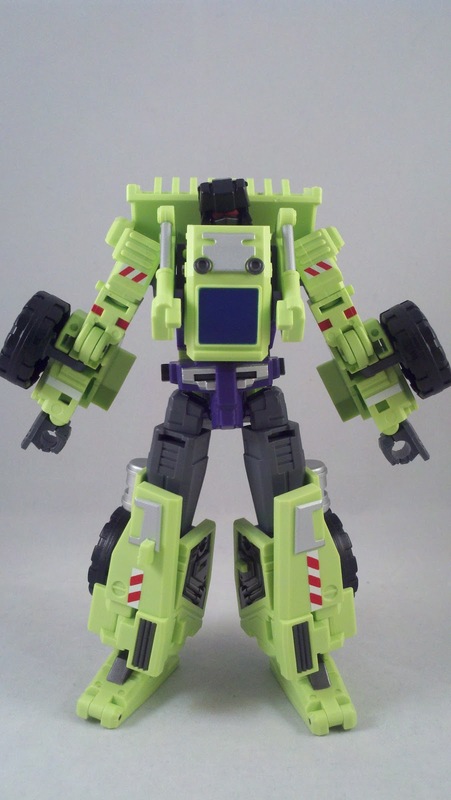 So far, GG Scrapper has lived up to what I'm looking for. 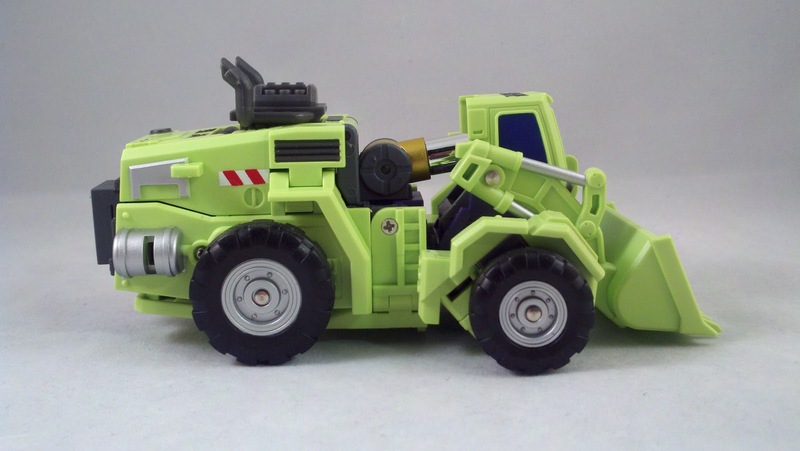 Green Giant was definitely kinder to my wallet than Hercules would have been. 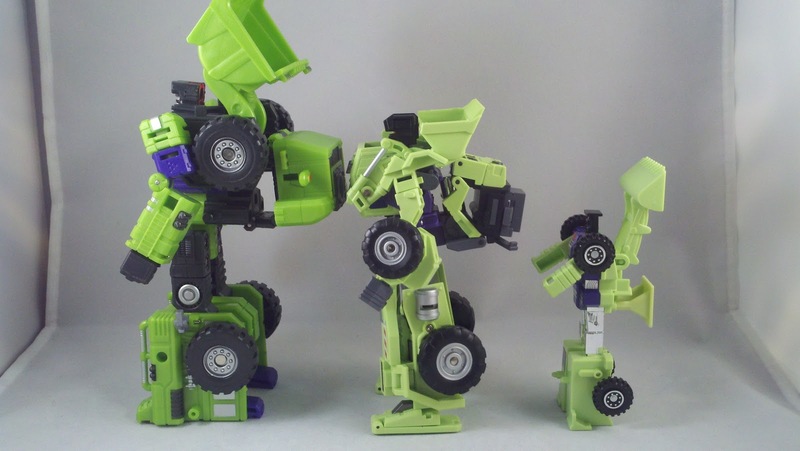 We've still got 5 bots to go and then the big guy himself to look at. So, thanks for reading and stay tuned! 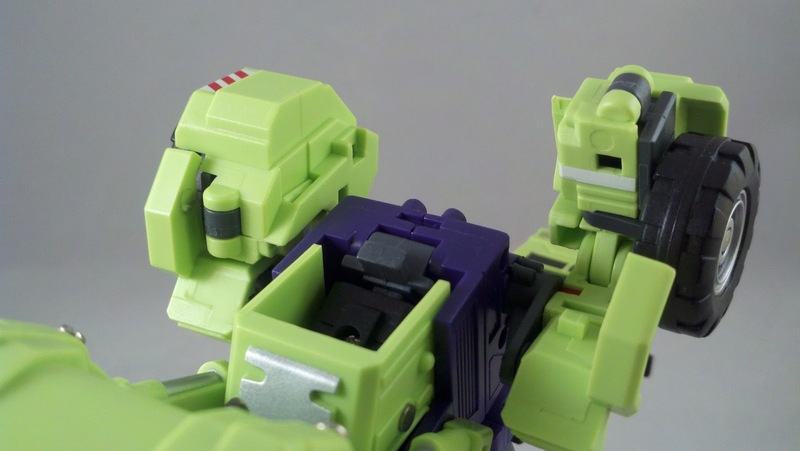 Pics, review and preparation for extermination by Scion of Primus. Nice! I'm excited to see a closer look at these guys, seems I only have TFC. Thanks Pax :) I'm working on the rest as fast as I can. I'm really happy with the figure(s) overall. Hopefully my reviews do them some amount of justice.